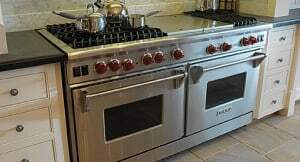 If you have an oven, and you most likely do, you have probably been putting off cleaning it for quite some time; however, there will come a time when you will no longer be able to avoid cleaning it. Cleaning an oven and its range is a task that many homeowners detest doing above all other cleaning chores. This is because cleaning an oven and range can become tiring, messy and time-consuming. Fortunately, if you spend a little time preparing, cleaning your oven and range will not cause as much trouble as you may think. Plus taking the time to clean your oven and range will prevent future instances of oven repair. When preparing to clean your oven and range, the first thing that you will want to do is open your kitchen window as you will need ventilation to avoid inhaling the powerful fumes that most store-bought oven and range cleaners include. You should also consider turning the heat completely off in the kitchen as fumes can become worse when the room is warm. Next, you will want to be certain that you have all of the basic and necessary equipment that is needed. These items include a durable pair of gloves, a towel or two that you will not mind getting dirty, an oven cleaning agent and easy access to running water. The water will be helpful for when you need to rinse off the grills once you have cleaned them. Many of the oven cleaning agents that are available in the market today are in the form of spray-on foam. The spray-on foam is usually recommended for those that are more inexperienced when it comes to cleaning ovens. Some oven cleaning agents have the tendency to drip, therefore, it is highly suggested that you place newspaper beneath the oven door. The newspaper will catch any drips that may fall onto the floor while you are cleaning the interior of the oven. The first step to the oven cleaning process will be to vacuum any loose debris that has been left inside of the oven. This debris includes burnt or loose pieces of food that can become trapped between the hinge at the oven door. Once all of the loose debris has been cleared out, it will then be time to apply the oven cleaning solution. Be sure to carefully follow the instructions that are included with the oven cleaning agent in order to ensure the best results. Once the cleaning agent is applied, leave the solution to work as long as possible. While you are waiting for the oven cleaning solution to work, you may give the grills, racks and range a good clean by using an abrasive scourer. Once you are satisfied with the results of the oven cleaner, be sure to wipe or rinse off any remaining solution from the oven very thoroughly. This is very important as you do not want any remaining solution dripping onto your food when you use the oven next. Although you may not be looking forward to cleaning your oven or range, it is a necessary chore that must be done every once in a while. Fortunately, there are several cleaning solutions available that can help make the task at hand much simpler for yourself. Please contact C&W Appliance Service for any of your oven repair needs in the Dallas, Fort Worth and San Antonio area. Call us toll free at 855-358-1496.